I've decided to give this baby doll to my son for his 2nd birthday because he can say the word 'baby' and likes to give his smaller one a bath. He sometimes moves the doll's head from side to side while saying 'no no no', its so cute! I chose this doll because it was the least ugly, in fact I think its quite gorgeous. I wanted to also use it as a photo prop, but as it turns out it's too small for the newborn hats and only fits the premmie ones. The problem was the doll is a girl and came dressed in very pretty pink clothes. Although the outfit I've made for her still looks feminine, I think its unisex colours are more suitable. 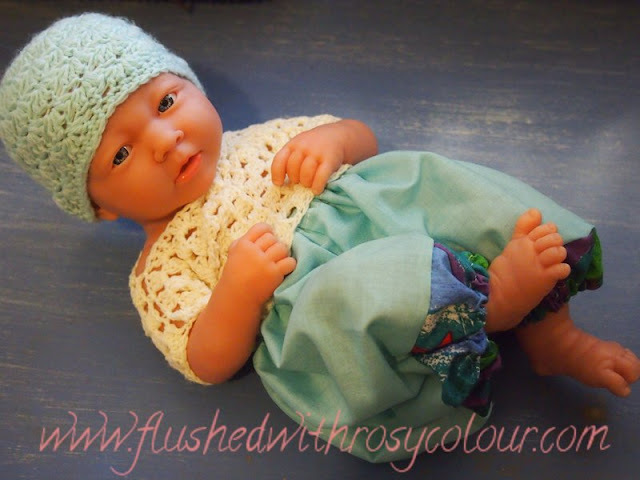 The tiny shells premmie beanie I made with cleckheaton baby wool fits perfectly, so I made an outfit to match. I simply did a hexagon jacket that was joined at the sides to make a sweater. Then I quickly made up some shorts in a matching aqua colour. I used a narrow strip of brightly coloured material I used for his toddler pillow to edge the shorts. But because I am more handy with a crochet hook than a sewing machine, yet again the shorts were way to wide around the waste but short up the middle! I solved the problem by turning the shorts into bloomers by threading elastic around the bottoms of the legs. Now she looks like a genie baby doll! All ready for my son's second birthday party on Friday. Yippee! !